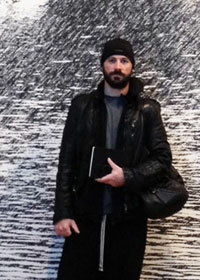 Justin Brice Guariglia is the first artist to join a NASA climate science mission. 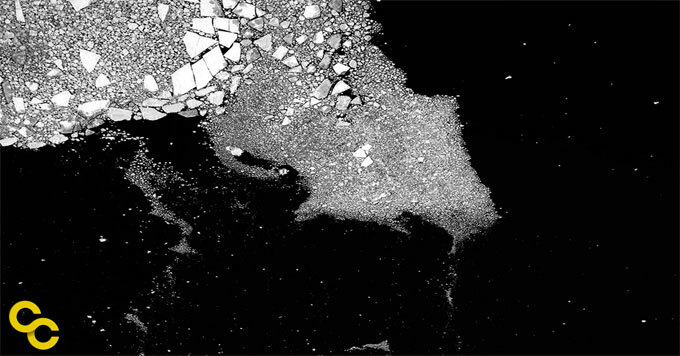 Baffin Bay Sea Ice I” artwork by Justin Brice Guariglia. An artist may not be the first person you’d expect to work with NASA. But for the last year and a half, Justin Brice Guariglia has been flying over Greenland with scientists who study the region’s rapidly melting ice sheets. Guariglia collects photos, videos, and sound recordings. He works with the scientists to understand what they’re learning. And then he takes everything back to his Brooklyn studio, where he uses it as artistic inspiration. In his work, Guariglia invites viewers to consider time and scale. For example, he has taken aerial photos of Greenland’s huge, rapidly-melting glaciers. Then in the studio, he’s printed them on massive, hard-to-destroy surfaces. Most recently, Guariglia became the first artist to be officially embedded inside a NASA mission. For five years, he’ll be part of the Oceans Melting Greenland Initiative. His job will be to take what the scientists learn about sea-level rise and present it in ways that make the rest of us think more deeply about global warming.